The kids may be back to school, but that doesn't mean you stop thinking about school supplies. I know our school has the kids bring in supplies at the start of the year as well as after Christmas break. So I make sure after school starts I go out and make sure I have a second set of everything on hand and am ready for that replenishment time. Many stores still have hot deals, and even some have clearance on school supplies after school starts so why not stock up early and be ready. You never know when someone might lose a marker, break their crayons, or have a friend in need. I know in our case my daughter asked for an extra box of crayons because a friend in class kept borrowing hers because she didn't have her own box. I thought it was super sweet of her to want to help her friend out so I pulled a box out from my stash and sent them to school for her friend. The thing I like about Crayola products is that they are quality made and always give you the best colors. I've made the mistake of buying off brand crayons before and they all broke in no time. Plus they didn't have the same bright coloring on paper either because they were so waxy. Since then Crayola is all I've ever purchased for my kids for back to school and at home. It's a brand I trust and know I can count on to give my kids the quality they need to excel in school and be creative at home. 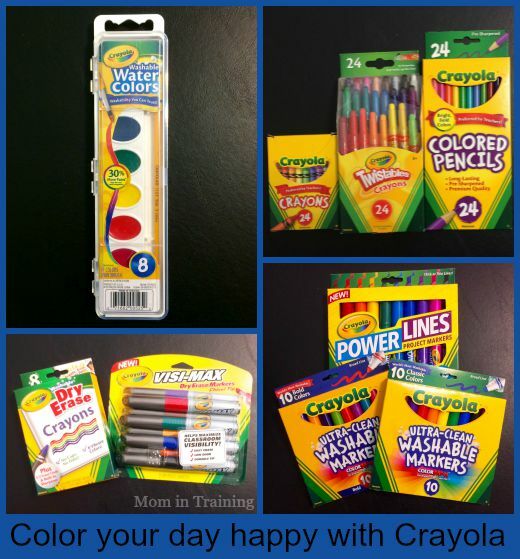 What Crayola products do you use to "color your day happy"? We have always loved Crayola. They have anything you need to color with.